True Wild Life | Aye Aye | The aye aye is a subspecies of lemur found on the south eastern African island of Madagascar. The aye aye are the biggest nocturnal primates in the world with some aye aye weighing more than 3kg! The aye aye is also one of the few solitary species of primate and therefore hunts alone for grubs and insects. The aye aye has rodent-like teeth and a long, thin middle finger that fills the same ecological niche as a woodpecker. The aye aye taps on trees to find grubs, then gnaws holes in the wood and inserts its long middle finger into the hole to pull the grubs out. The aye aye is considered to be a near threatened species, possibly even endangered with very few aye aye left in the wild . The second subspecies of aye aye is thought to have become extinct at some point in the past 1,000 years. 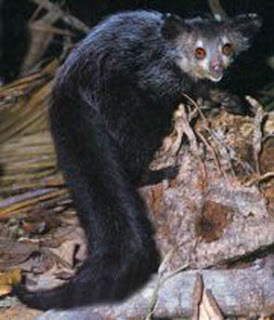 The aye aye inhabits the forested and jungle areas of the east side of Madagascar, but the aye aye is also commonly found in bamboo thickets and are occasionally found hunting on the ground. 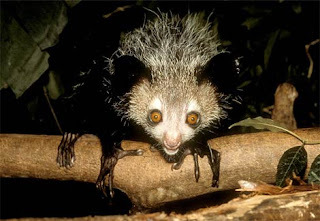 The adult aye aye has black or dark brown fur covered by white guard hairs on the neck of the aye aye. 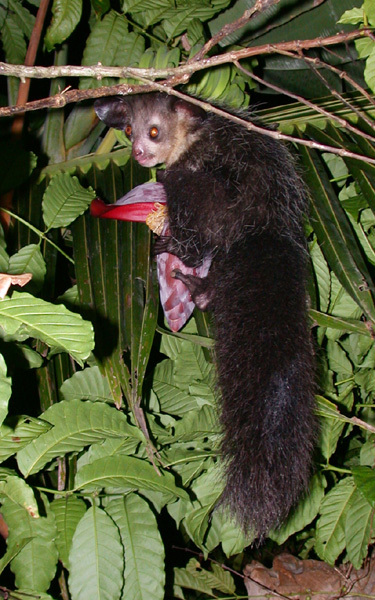 The aye aye's tail is bushy and shaped similar to the tail of a squirrel. The aye aye is also thought to have a rodent like face that is similar in shape to the face of a raccoon. 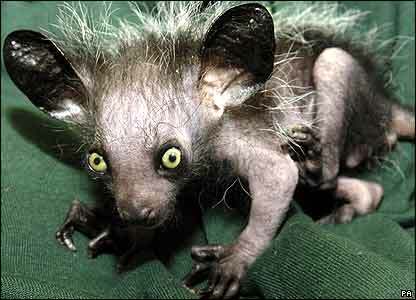 The aye aye also has big, bright, beady, luminous eyes that help the aye aye to see better in the dark. The aye aye has very large teeth that grow continuously throughout the aye aye's lifespan. The aye aye's rodent like features contrasted with the aye aye's monkey like body are probably the reason why scientists originally classed the aye aye as a rodent and then re-classed the aye aye as a primate after further studies. The aye aye has large feet in comparison to their body which the aye aye uses to hang itself from tree branches whilst foraging for food. 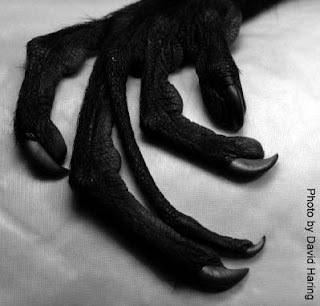 The aye aye medium length fingers that have claws on the ends of them that help the aye aye to grip onto branches when its hanging on the trees. The aye aye has an extra long and specially adapted middle finger on each hand which has a nail on the end, which the aye aye uses to remove grubs from rotting wood. The movement of the aye ayes long middle finger is independent from the other fingers and means that the aye aye is even able to use this finger to drink liquids by moving it quickly between the liquid and the mouth of the aye aye. The aye aye moves by walking on all four feet and is able to walk and climb well and is extremely adept at leaping between branches in the trees. The aye aye uses its sharp front teeth to tear into wood before using the special middle finger to dig the grubs out from beneath. The aye aye has sharp incisor teeth at the front of its mouth that grow continuously so that they never wear down. The sharp front teeth of the aye aye must be ground down all the time to prevent them from getting too big and the aye aye does this by gnawing on nearly everything it finds. The aye aye uses the long middle finger to tap all the way along a tree branch until it hears what it is looking for and then uses the chisel-like teeth to bite a hole in the wood. The aye aye is thought to have 25 teeth including the sharp front incisors and the sets of molars that the aye aye uses to chew the food before it eats it. these are by far the weirdest most adorible things i have ever seen ohmiguh!!!! Aye-Aye is seen as a demonic symbal by some cultures. It's said that if an Aye-Aye points it finger towards you (the middle, needle-like one) then grest misfortune - usually death - will fall upon your family.